Great suggestion. Had a lot of fun testing this. The program is blessedly simple, will run multiple timers simultaneously, and even has a profile system to track different activities (you have to start a new one to run two timers). You can even enter hours in for time frames that were not specifically timed (manually add to the eventual report). 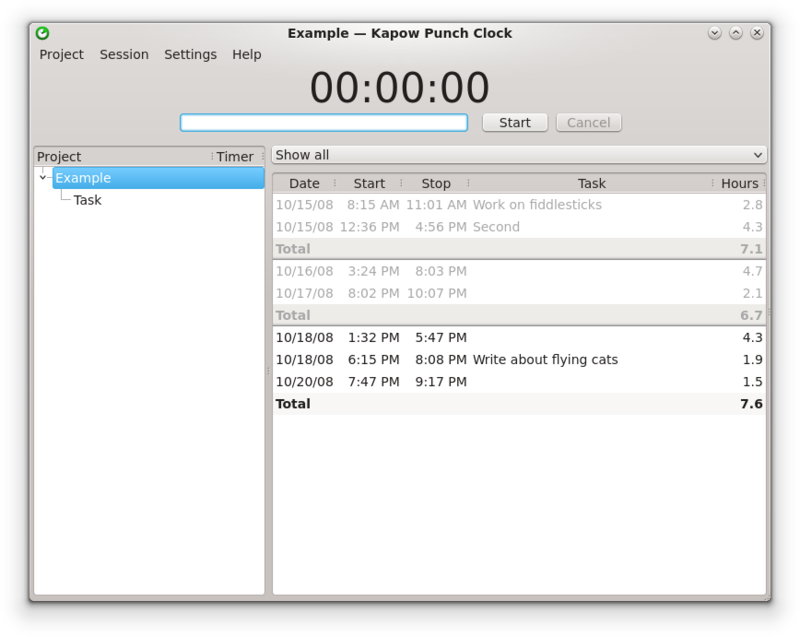 I really like this program and might use it to keep track of time-spent on projects. I'd like to see a program that uses less RAM (starts out around 7, lowers to 6.4). I can think of a few ways to integrate a calendar into this - even just a thumbnail of the month ahead would be cool, but also listing days where a time was recorded would be nifty. Something to fill up space on the top bar. Ability to save to a PDF (or similar format) rather than print out a document. Obviously a print-to-PDF driver (like pdfcreator) would do the trick, but that requires an install and I'm trying to stay in the no-install camp. I doubt that a Qt-based program can be low in resource usage (Kapow version 1.5.2 uses Qt version 5.7.0 which is hungrier for resources than Qt version 4). Anyway, by using Qt Kapow is cross-platform. Kapow has a tray icon, single left-click minimizes/maximizes program window- when minimized to tray the program doesn't appear in task-bar.